The campus bookstore can represent many experiences to many different audiences: To students, it can be a place to drop by for a cup of coffee, to meet friends, or pick up their textbooks; for Alumni, a must-stop on game day for their team’s colors. But at its core, the bookstore still retains an academic mission, which is why Barnes & Noble College is unapologetic in its outreach to that most essential segment of the college community: faculty. Since the Igniting the Faculty Connection program was created last year, faculty have represented a key point of focus with over 90,000 college faculty members receiving the first of a new series of communications at the beginning of this year. 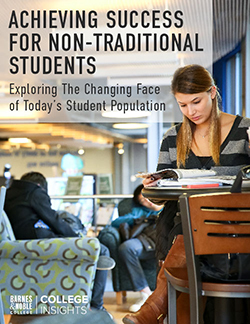 “What we’re trying to achieve with these initiatives is to really extend our connection to faculty beyond just the textbook adoption process,” explains Barnes & Noble College’s Director, Digital Education, Nicole Guerrieri. And the place essential to building that connection is the campus bookstore. 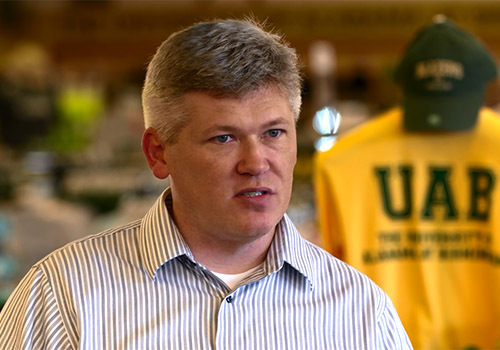 George Bennett, Store Manager of the Barnes & Noble at UAB Bookstore on the campus of The University of Alabama at Birmingham. 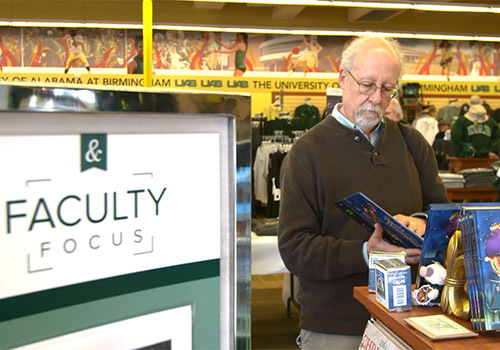 That connection is being particularly nurtured at The University of Alabama at Birmingham (UAB), where Barnes & Noble at UAB Bookstore Manager George Bennett hosted a Faculty Focus event at the end of last term. “It was really an opportunity to say thank you to all of our faculty and staff for their work with us throughout the year,” he explains. “We wanted them to meet with us in the relaxing environment of their store, meet some of our vendors, and if there were any specific academic questions, we were happy to answer them,” he adds. 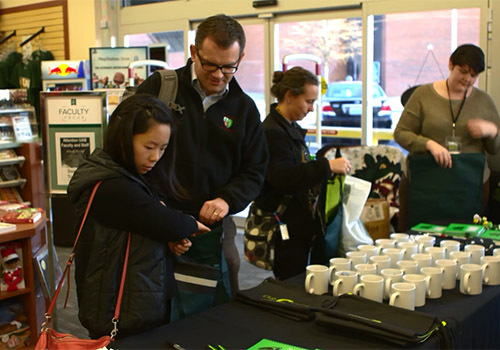 Although the event provided the opportunity for faculty and administrators to learn more about FacultyEnlight, the Barnes & Noble College online adoption tool, Bennett saw the event more as a way to reaffirm the relationships the store has built throughout the year in a fun event with door prizes, giveaways and even 20 percent off store merchandise. “We’ve been working with members of the Faculty Senate throughout the year, and that, combined with our relationship with the Provost’s Office has really helped us create a foundation to build on with events like these,” he says. Stephen Murray, UAB’s Director of Business Services, agrees. “Having the faculty come in and actually meet the people they’re emailing or talking to on the phone goes a long way towards building relationships,” he remarked. The Faculty Focus event at the bookstore may have been a success, but Bennett recognizes that there’s more work ahead. “We’d really like that day-to-day, one-on-one relationship with faculty — to help change their perceptions about the store, and find more areas where we can help them,” he says. UAB faculty attend the Faculty Focus event held at the Barnes & Noble at UAB Bookstore. FacultyEnlight has itself, become a case in point. “I think, initially, faculty thought of it as an extra step in the administrative process for textbook adoptions, but everyone we’ve showed it to immediately understands the advantages, the opportunity to see the prices options upfront, and the ability to save money and confirm that particular book is available,” he adds. The success of these kinds of initiatives has led Bennett to appoint a FacultyEnlight Ambassador, Lea Rizzo, a UAB student bookseller who has trained on the program and is familiar with adoptions, to liaise with faculty. It’s part of the process of bringing faculty closer, which is also the mission of Jenna Radigan, a Senior Corporate Marketing Specialist at Barnes & Noble College, who helped support the Faculty Focus event. “It’s our store managers who have the best opportunity to really help faculty understand all that the bookstore has to offer, particularly those who are involved in the textbook adoption process,” she says. I teach at Rowan University, I was asking around at Rowan Barns and Nobel to see if I can run my help session at the store. Would you be able put me in touch with the manager? Thank you for requesting to speak with the manager of the Barnes & Noble at Rowan University bookstore. We would be happy to connect you with the manager to discuss your request. Please send your contact information to our mailbox (info@bncollege.com), along with a brief description about the help session, and someone from the store will contact you.